Don’t be alarmed on move-in day when you walk into your student’s bare and cold dorm room. It’s amazing how quickly this space can change with planning and some trips to Bed, Bath and Beyond, Target and Walmart. The key to transforming the dorm space into something a little homier is preplanning. Pinterest alone has enough ideas to make your head spin. Of course, decorating for a girl’s room is drastically different from a boy, but both will need a little extra organization. Either way, check the size bed their dorm will provide. UNF freshman residence halls (Osprey Cove, Osprey Crossing, Osprey Hall and Osprey Landing) offer twin extra-long beds. Two of the upperclassmen dorms (Osprey Village and Osprey Fountains) both have twin beds. The last upperclassmen dorm (The Flats at UNF) offers double size beds. The Flats at UNF are more apartment style housing. Over the summer, the store shelves will begin to fill up with sections specifically for college dorm life. Here you will be able to easily find many organizational options and sheet sets in twin extra long. The bed-in-a-bag can be a great choice as it provides many pieces at once. In addition, we highly recommend a mattress encasement. It protects from bugs, allergies and who knows what else. A mattress topper is a must; the beds can be rather thin. The topper will make the place they spend much of their time more comfortable. 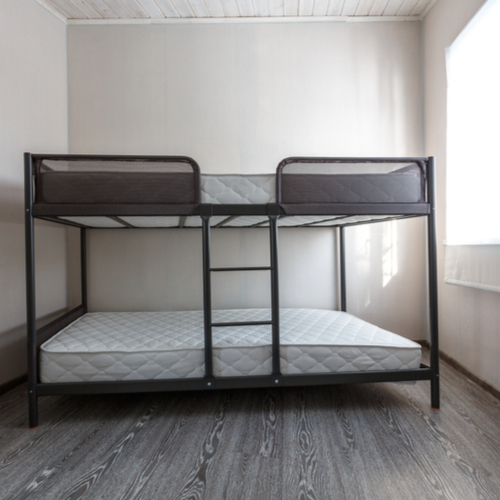 The beds in the dorms are all adjustable up to 32” and risers or concrete blocks are prohibited. There is plenty of room under the bed for extra storage. Mini refrigerators, extra storage bins, laundry bins, and baskets will all fit perfectly under the beds. An excellent place to put small books, pens, pencils or even a light laptop is in a bedside storage pocket. Students usually have space for a comfortable chair. Most girls really like to fully decorate the space. If possible, suggest they check with their roommate before you begin your multiple trips to Bed, Bath and Beyond, etc. My daughter and her roommate went Dormify crazy over the summer, and together they decided on specific colors. Lately, covering the walls in big tapestries is the rage. Etsy and Wayfair have an incredible amount of different styles and some beautiful colors to add to the drab walls of the room. You cannot put any holes in the walls, this also makes it difficult to hang things, but no worries; because Command hooks have you covered. Area rugs also warm up a room and bring in some color. Another popular item is string lights. You’ll want to buy a tension rod and a curtain for the closet. The closets in the dorms do not have doors, so a curtain is a great substitute door to hide clothes, shoes, or any disorganization that may occur in there. If they know their roommate’s name, a custom dorm room sign is a great way to make them feel at home. I haven’t forgotten our sons; there just isn’t as much to say. Basically, they will need the same essentials, but as far as décor goes, most boys are happy with a poster or two and possibly a flag or banner. UNF paraphernalia is usually a hit too. A great place to also shop for boy’s dorm decor including easy-to-shop bundles and dorm inspiration is Pottery Barn Teen (PB Teen). The best advice that was given to me was to start shopping early. Your student will have the most options to choose from and you’ll be able to get everything you need. There are different kinds of dorms throughout campus ranging from suite to corridor to apartment style. When you find out which dorm your student will be living in, you can check out the floor plans as well as get an idea of what UNF Housing supplies. For our complete list of the top items they need for college, click here.